Happy Friday! I hope you have all had a great week! Today, I'm rounding up eight items that I am currently loving. I have been adding pieces to my closet that I can wear now and later when it actually feels like fall. It's been in the eighties where I live this week! Also, don't miss the awesome giveaway at the end of this post! Hint: you can win one of my favorite picks from this week! 1. Camo Jacket | I have been hesitant to add any camo to my closet because it's a little out of my comfort zone. But I love the look of this jacket! I think it would look adorable over a t-shirt dress or with a feminine blouse and skinny jeans. Plus it's currently on sale! 2. Striped Dress | I love finding good basics for great prices! This dress is less than $13 and would look so cute with the jacket above. 3. Oversized Sweater | Another great piece for a steal! This sweater fits oversized (which I am loving right now) and comes in three pretty colors. So perfect for fall and winter! 4. Jeans | I already own these jeans and the fit is great! I love the frayed hem and the dark wash.
5. 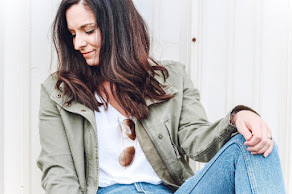 Ankle Boots | I haven't bought a new pair of neutral ankle boots a couple years so I have been on the hunt for a great pair that I could wear on a daily basis. I love the color of these and I love the easy to walk in heel height! 6. Off the Shoulder Sweater | I just bought this sweater this week and I can't wait to get it in the mail! The reviews are amazing and I love the off the shoulder style. I plan to wear it with my favorite bralettes and leggings for an easy, weekend look. 7. Earrings | How gorgeous are these new Kendra Scott earrings from their fall collection?! I love the shape and the stone is so pretty. If you love these too, make sure you check out the bottom of this post. 8. Tie Front Skirt | I don't own many skirts but this tie front skirt from Target caught my eye as soon as I saw it on the website. It would be dressed up or down and it's a great item to wear now or later when the weather gets cooler. 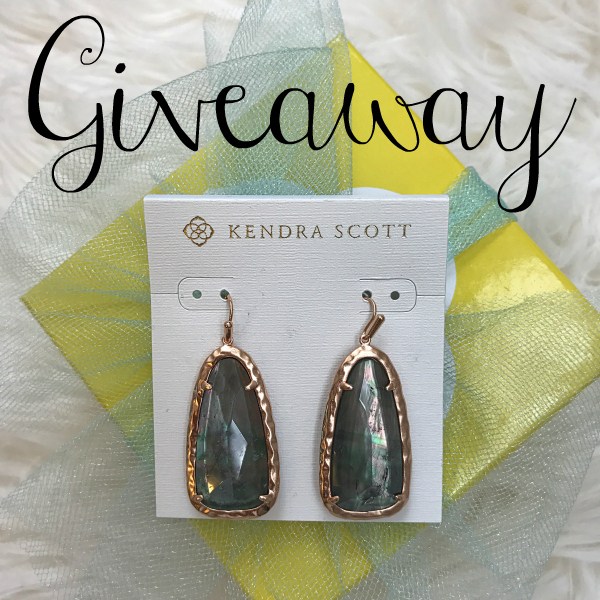 Want to win this gorgeous pair of Lyn Drop Earrings In Crystal Gray Illusion?! 1. Leave a comment on this blog post below and let me know how you would style these earrings for fall. Be sure to also leave your Instagram username in your comment. 2. Follow me on Instagram. 3. Like the most recent "Currently Loving" Instagram post, featuring the items from today's post and tag a friend in the comments who would also love these Kendra Scott earrings. The winner will be randomly selected and announced here on the blog Monday, September 25 at 7:00 AM EST. Good luck! I love all of your picks this week! You have such great style! I absolutely love these Kendra Scott earrings- such a beautiful color that I think could take you through all the seasons. My birthday is next Thursday, and our family vacation to Puerto Rico this past week was canceled due to Maria (and we still can't get I touch with our family there)- so winning these would be extra special! This Mama has her fingers crossed! Thank you. I love that camo jacket and 40% off! What a great deal! Happy Friday Emily! #1 & 5 are my absolute favorites! I always love all your currently loving picks. You always. Goods things I would buy and wear. I would pair the earrings with a light denim top and black jeans. What a fun post idea! I love hearing about others' favorites for the season. I'm especially digging that camo coat and the grey skirt. So adorable for Fall! I would pair those earrings with anything black, which is most of my wardrobe, and my long, simple gold necklace. I really love that skirt, super cute!! I would style these earrings with a black tunic top and skinny jeans. I would wear a pair of low cut boots to go with!